This content was published: May 22, 2017. Phone numbers, email addresses, and other information may have changed. For many months, the Rock Creek Campus has been celebrating its 40th anniversary as well as the completion of the major overhaul of one of its key structures, Building 5. Last week that project won first place for renovation in The Daily Journal of Commerce (DJC)’s TopProjects competition. 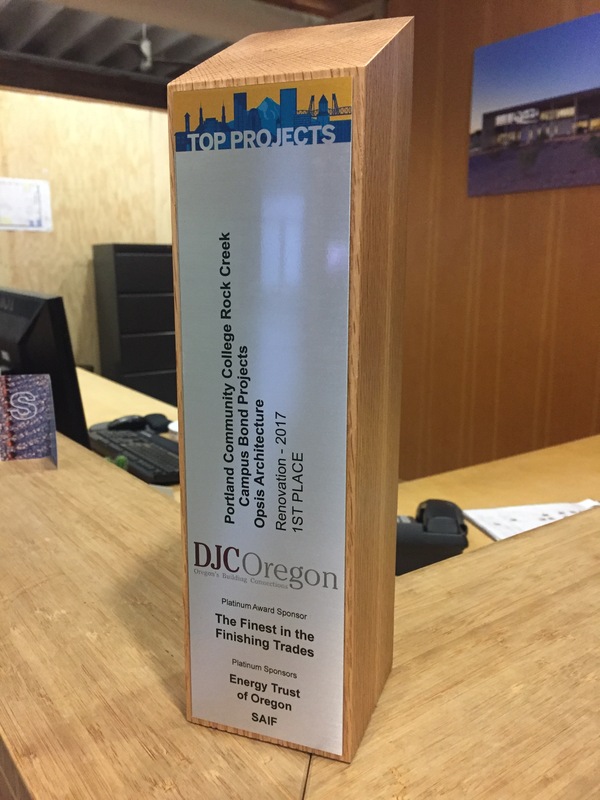 DJC is a leading source of building industry news in the Northwest and each year the competition recognizes the most outstanding projects completed in Oregon and Southwest Washington. Rock Creek earns first prize for renovation at this year’s TopProjects competition. 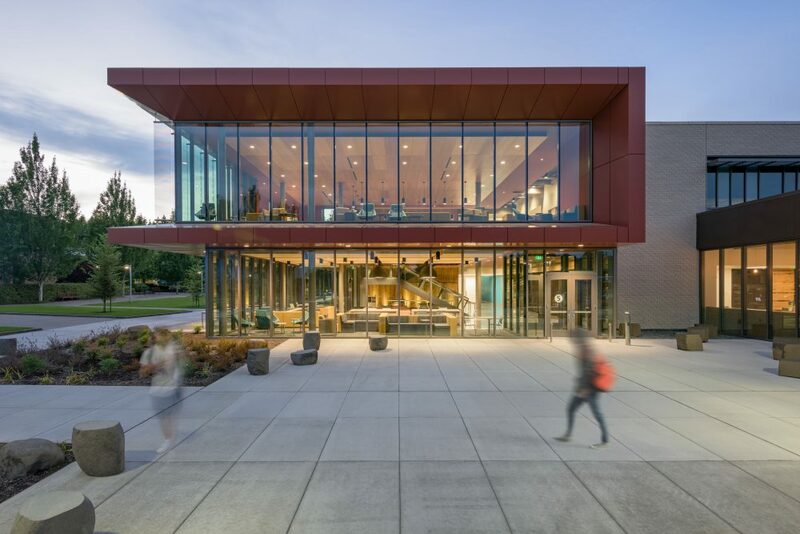 Building 5’s $21.5-million renovation was the largest project at Rock Creek funded by the 2008 voter-approved bond measure, and required the demolition of more than 20,000 square feet and the construction of a strikingly modern 63,000-square-foot addition. The facility is now the heart and hub of student activity, home to the resource centers, cafeteria, book store, study space, Foods and Nutrition lab, physical education facilities, classrooms and more. Glass is now a prominent feature of Building 5. The floor-to-ceiling windows that face the main roadway into campus help give Rock Creek a welcoming, “front door” presence and also flood the building’s indoor spaces with natural light even on overcast or rainy days. Vertical panels on one side of the new addition add not only architectural interest but help to control solar heat gain. It’s just one of the features that is expected to help Building 5 earn a minimum gold rating from LEED, the nation’s leading certification program for energy efficiency and sustainability. Rock Creek also earned an honorable mention at this year’s TopProjects competition in the major renovation category sponsored by the Energy Trust of Oregon. This award recognized the entire scope of PCC’s bond work at this campus. Thanks to the capital construction bond, PCC is investing more than $63 million to build, renovate and upgrade Rock Creek. Opsis Architecture was responsible for the design of the bond improvements at PCC Rock Creek; Fortis Construction served as construction manager and general contractor.